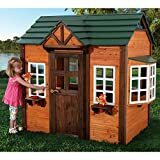 Would like to build a wooden playhouse for your kids but are worried that you don’t have all of the required tools or skills? There are books, plans and tutorials on building a playhouse but If you have only rudimentary carpentry skills and a few tools that most of us keep in our homes, you still might be able to build your child the playhouse of their dreams. Before you even start shopping for a wooden playhouse, check your lease, property covenants or local zoning rules. Some might totally ban the building of structures in your yard or require permits if the structure exceeds a certain size. It would be terrible if you had to remove the house after your children have already fallen in love with it. Do you homework first to avoid tears later. With pre-fabricated wooden playhouses and playhouse kits, someone else has done most of the work for you. You don’t need a workshop full of tools, though an electric screwdriver is recommended. The wood comes pre-cut, with pilot holes already drilled for the screws. But, be sure to read the product descriptions carefully. Some wooden playhouses come with absolutely everything included. Others may require you to buy your own paint, shingles or offer optional upgrades. Flooring is often not included or may be an upgrade. Most of the wooden and plastic playhouses that we have reviewed should be anchored to the ground. A number of the plastic playhouses came with anchoring systems. However, it seems most wooden playhouse manufacturers do not include materials to secure their houses. Don’t assume the greater weight of a wooden playhouse will be enough to keep it from being moved or toppled over if you live in an area that is prone to high winds. Just make sure you understand what you are buying. That bargain-priced model may not include the wood, the floor or anything other than project plans. Some models have framed window openings, some may have a solid glass or plexiglass panel and others may have fully functional windows with screens. The ability to use your outdoor playhouse on rainy days or in the winter will vary from model to model. 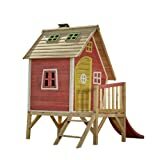 You can find wooden playhouses for around the same price as some of the plastic playhouses. Some models can be purchased for less than $400, including shipping. The average seems to be around $700, with shipping. However, there are some truly fairy-tale models that can cost between $10 and $20,000 that have working windows, two stories and look like mini-mansions. Yes, for the most part, smaller wooden playhouses are on the lower-end of the price range. Depending upon features like windows, window boxes and finished interior walls, prices can vary greatly. But, for $500 or less, you can make a lovely playhouse that will provide your children with hours of fun. The Bayberry Playhouse is a charming little option. As you can see, it comes with several windows, a bit of white picket fencing and even a cupola. This playhouse also provides a great example of something to look out for when shopping for playhouses. The overall dimensions listed for the house include both the cupola and the picket fence. According to one parent, the actual interior of the house measures around 4 feet square and 5 1/2 foot tall. It also comes with square head screws, so you may need to buy a new screwdriver or bit to put it together. This playhouse comes with a door, windows that can be opened and closed, a mailbox and a realistic kitchen sink. This one is a bit smaller than the Bayberry, with the inside dimensions measuring around 45 inches by 33 inches. It is the least expensive of the wooden playhouses that we have looked at. The roof is made of plastic and a few families have reported that their roofs have faded to pinkish white after a few years. Most felt this playhouse was quite sturdy and made a great alternative to a plastic playhouse. There are quite a few charming wooden playhouses available for between $500 and $1,000. Rather than trying to list everything, we will showcase two of the more interesting and popular models. My Wooden Playhouse by KidKraft is a charming option that generally sells for around $700 but shipping is often extra. It comes with a working doorbell, sliding back window and two window boxes with flower pots. Inside, there’s a play sink with a faucet and knobs and an outdoor grill counter. Our favorite part of this playhouse is the number of windows and doors; including the pretty bay window on the side. This model has a green plastic roof but we did not find anyone who reported that it had faded. The structure itself is made of cedar and everyone reported that the house was sturdy, once built. The interior measurements of this playhouse are around 59 inches by 42 inches. The inside height varies from 4 feet around the walls to over 5 feet at the peak. The folks at Swing-N-Slide offer a number of outdoor wooden playhouses in this price range. One of our favorites is their Hide and Slide Play House. This quirky and colorful crooked playhouse is elevated around 2 feet off of the ground and comes with a little slide. From all reports, this house is a bit smaller on the inside, measuring about 3 feet square. But, this one comes with a floor and one would hope the elevation might help keep it more free from uninvited visitors. The windows on the roof are only framed, which unfortunately means this house is not waterproof. There’s been quite a bit of online chatter about the TrueModern Playhouse but it doesn’t seem like anyone who has actually purchased one has shared their views of this playhouse. Designed by Edgar Blazona of Modular Dwellings, the MD-20 Playhouse is eco-friendly and made in the USA. The colorful panels are removable and it comes with two wall-mounted paper tablet holders. Sounds like the perfect place to let your budding Picasso paint and draw. You have to purchase the tablets separately but oddly enough, the house comes with a marker and pen holder. It is made of sustainable birch plywood and MDF with birch veneer but is not weather-proof and should only be used inside. When it comes to craftsmanship, most agree that the Amish are often among the finest woodworkers in America. 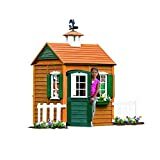 It is little wonder that their children’s playhouses, sold under the brand name Little Cottage Company are more like miniature homes than a toy. Their kits come with real, working windows with glass, grids and screens; entry doors for parents and children and features not commonly found in lesser-priced models. Most models include floors but do not include shingles, drip edges or paint (the exterior boards are, however, primed). The Pennfield Cottage measures 11 feet by 8 feet and features a pair of dormers and a front porch. This model can also be upgraded to include extra shutters, a loft, the chimney, extra windows and the flower boxes.